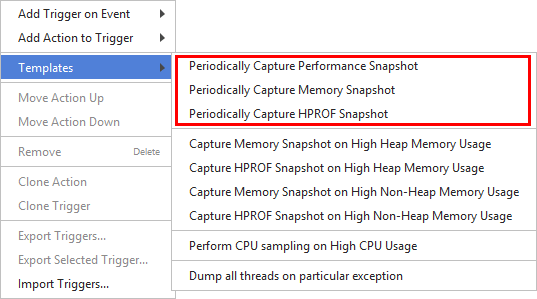 Please also consider the ability to capture memory snapshots on high memory usage or on OutOfMemoryError. You can instruct the profiler to capture a snapshot after a specified period of time. When used memory constantly increases, this often means there is a memory leak. This feature greatly simplifies the detection of such situations in e.g. long-running applications such as servers. One of the benefits is that, after being triggered, the feature requires no further human interaction. Use startup option periodicperf, periodicmem, periodichprof.